BLUFF Township is situated on the north-eastern side of Bluff Hill which forms a knoll at the southern end of the Bluff Peninsula extending into Foveaux Strait, within the Invercargill City boundary, Bluff is the terminal point of State Highway No. 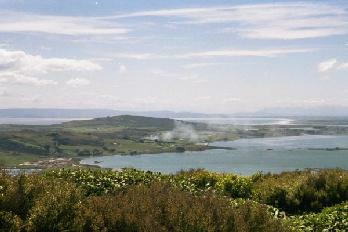 1 (Picton-Bluff), 27km south from Invercargill and 254km south-west of Dunedin. It is the port for Southland and the junction for the daily catamaran service (Foveaux Express) to Halfmoon Bay, Stewart Island, 35km to the south. The Maori name for Bluff is Motu-pohue, Motu because of its island-like appearance from the sea, and pohue due to the white convolvulus which still flowers in the forest. Principal industries include commercial fishing (crayfish, groper, and blue cod, from the waters of Foveaux Strait) oyster dredging, and marine engineering. On the Tiwai Peninsula, on the east side of the harbour is the New Zealand Aluminium Smelter, processing alumina from Queensland, Australia, using electric power from Manapouri. Reserves include the Bluff Scenic Reserve with the Glory Walking Track, the Foveaux Walking Track and Argyle Park. The International Signpost at Stirling Point is as far south as you can travel by road in New Zealand and a major tourist attraction. Other attractions around the town are Fred and Myrtle Flutey's world famous Paua Shell House, the Bluff Hill Lookout,from here a panoramic view of Southlands mountains, plains, estuaries and islands is revealed and the Island Harbour to name a few. Please come and visit them to get a feel of our town. (above) Looking out west over Ocean Beach, from the top of Bluff Hill. Shipwrecks of the South Coast Before 1900.